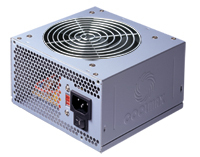 The I-500 is perfect for casual, everyday users who need an efficient power supply that can deliver the watts necessary without all the additional features. With components designed for longer life, the I-500 is the perfect candidate. It has a silent 120mm fan that is quiet to the ears with maximum cooling efficiency. Also with neat cable wires, the I-500 is simple to use, easy to install, and still has all the power necessary to run your system smoothly.